Alaska Naturals Wild Alaska Salmon Oil Original Made from wild Alaskan salmon sustainably-fished in the pure water of Alaska, this high-quality supplement delivers concentrated DHA and EPA omega-3 fatty acids to help your pooch achieve smooth, healthy skin and bright, lustrous fur. Rich and flavorful salmon oil also delivers powerful antioxidant support for his overall health and immunity, including strong cardiovascular health. Rich, flavorful oil is made from fresh wild salmon sustainably caught in the pure waters of Alaska. Concentrated DHA and EPA omega-3 fatty acids help nourish your pup�s skin and promote a smooth, lustrous coat. Omega fatty acids also support healthy immunity, good cardiovascular health, and strong brain and nervous function. Proudly made in the USA without the use of artificial preservatives, colors or synthetic flavors. Oil is stabilized with natural tocopherols to maintain freshness; each bottle is nitrogen-purged to remove oxygen and extend shelf life. INACTIVE INGREDIENTS: Salmon Oil, Mixed Tocopherols (preservative). For maintenance purposes, give pet 1/2 teaspoon per 10 lbs of body weight daily. Add oil to food, or feed directly as a treat. For best results use on a long-term basis; studies have shown that fatty acid levels reach a steady state within about 1 month of starting supplementation. If bottle is fitted with a pump, 1 pump equals approximately 1/2 teaspoon. Boy does he eat it up! 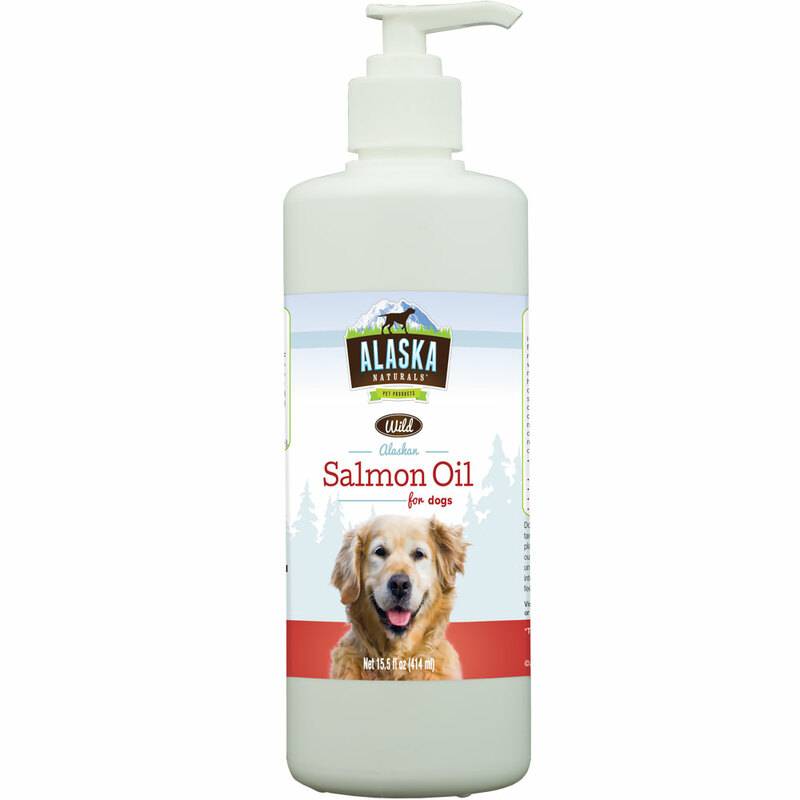 We purchased Wild Alaska Salmon Oil to help with our dogs skin, coat, & joints. His coat is beautiful, it has helped his dry skin issues but we use additional things for his skin. I do not know if it is helping his joints. The best thing about it is that we put a few pumps on his dry dog food and it has become his favorite meal. ProsIts priced well, it has helped his appetite, it has helped his coat, and it hasn't caused any side effects. I have previously purchased the larger container, with my two basset hounds loving it. This time I purchased the 15.5 oz bottles, because they fit better in my kitchen cupboards. My houndies LOVE this "wild" salmon oil on their crunchies every night! The bottles arrived with leak-proof packaging and very promptly. I have tried others, but the Alaska Naturals have a much more predictable pump (that doesn't surprise you, squirting all over the place). Great price as well! This salmon oil (plastic) bottle came well packaged and did not leak. It's hard to find "wild" salmon, rather than farmed (which is disgusting). The fact that the wild salmon came from Alaska is great, because there is much less pollution in the water up there (rather than from the California coast). My two basset hounds get the salmon oil added to their evening meal. They start barking as soon as I pull the container out of the cupboard. Obviously they love it. ProsComes in an easy to use pump bottle. Alaska wild salmon is the best quality. My houndies love it on their food. ConsIt stinks, as do all brands of salmon oil.